These days LinkedIn are celebrating passing 200 million profiles. This is done by sending us members a mail telling about our part in the success. The mail message is easily sharable on LinkedIn, Twitter and Facebook. What I’ve seen is that you can be among the 1 % most viewed (including yours truly), the 5 % most viewed, the 10 % most viewed and among the first 500,000 members in a given country. 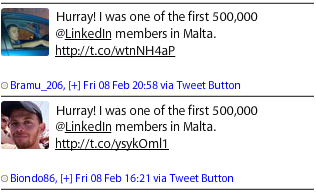 The latter incident includes for example being among the first 500,000 members in Malta. I guess that will include every member in Malta as Malta has a population around 450,000, unless of course the Maltese are world champions in creating duplicate profiles. Next Article Is Managing Master Data a Differentiating Capability?